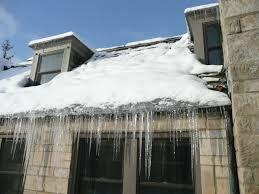 Ice dams are more or less overgrown icicles; they are ridges of ice that form at the edge of the roof along the gutters or soffit. Though it makes for a visually stunning formation, they're a big hassle to deal with. As implied by the name, they prevent melting snow from safely draining off the roof, possibly backing the water up so that it leaks into the home instead. This will end up in damage to your ceilings, walls, insulations, and more. Ice dams form from an unlucky combination of a roof filled with snow, a warm roof surface that is above 32°F, and a colder lower portion that is below 32°F. As the snow melts off the warmer section of roof (often due to unusually warm air in the attic), the water runs down until it reaches the colder temperatures and starts to freeze, creating an ice dam. The dam will continue to thicken as more water melts from above and is added to it. What Are Signs You Have an Ice Dam? Though ice dams are known to have icicles, you don't need to be overly suspicious of every icicle you see. It's perfectly normal for small icicles to form throughout the winter. When you start to notice larger and thicker icicles hanging from your roof, then you should really start to worry about an ice dam forming. Some other signs include ice coming from the soffit and gutters, water and ice developing on outside walls of the home, and water leaking into the house through walls, ceilings, door frames, or windows. How Do You Prevent and Deal with Them? Proper precautionary steps are the only way to prevent ice dams. Have your attic well ventilated and cool, clean your gutters before the winter, keep your roof cleared of snow, insulate the attic floor, control heat loss from the home, and consider utilizing a water-repellant roof spray or membrane. But if an ice dam has already formed on your roof, there are immediate actions you can take to prevent further damage: remove any snow from on top of your roof, apply an ice-melting product like calcium chloride onto the dam, find ways to prevent heat loss from the home, or cool down the attic below the melting snow. Ice dams may appear harmless and look beautiful, but they can cause expensive damage to your home if left alone for too long. If none of the above methods provide a fix, the best solution is to hire a professional to come and remove the ice with specialized procedures before the damage becomes extreme. Do you have any questions or concerns? Disaster Professionals offers 24/7 water damage cleanup and disaster response experts who can answer any questions you may have. We're happy to help!